over 200 locations. If you would like a copy sent to you, please send mailing information and $4 (payable to Towns & Associates) for each copy to Madison Essentials, c/o Towns & Associates, Inc., PO Box 174, Baraboo, WI 53913-0174. 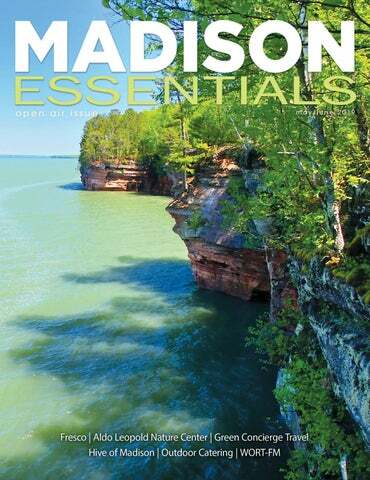 To purchase an annual subscription (six issues), send mailing information and $24 (payable to Towns & Associates) to Madison Essentials, c/o Towns & Associates, Inc., PO Box 174, Baraboo, WI 53913-0174. Or sign up for a FREE online subscription at madisonessentials.com. We welcome your questions and comments. Please submit to Madison Essentials, c/o Towns & Associates, Inc., PO Box 174, Baraboo, WI 53913-0174 or email ajohnson@madisonessentials.com. To place an advertisement, please call (608) 445-5556 or email khopkins@madisonessentials.com. No portion of this magazine may be reproduced without prior written permission by the publisher, Towns & Associates, Inc.
Watch for the next issue July/August 2019. Cover photograph— Taken at Apostle Islands. Photographs on page 3: top—Provided by Aldo Leopold Nature Center. middle—Taken at Hive of Madison by Eric Tadsen. bottom— Provided by Lemongrass Madison Catering. Mention Madison Essentials and get 5% OFF your next session. For the past 25 years, something special has been happening on the 20 acres at Aldo Leopold Nature Center (ALNC) in Monona. It’s magical actually, and it can’t be found in any book or on a website. It has to be experienced and explored. It’s intriguing, beautiful, and awe inspiring all at once. When a child recognizes a groundhog running down the trail into tall prairie grass or watches a monarch butterfly emerge from its chrysalis for the first time, a bond is created—a curiosity sparked. When a family hikes to the pond dock and, using a net from their Trailside Backpack, pulls a squirming tadpole from the water, shared experiences are generated, sparking memories that can last a lifetime. and forward-thinking Monona residents organized a campaign, and after extensive negotiations, the City of Monona purchased the land with a stipulation that a nature center be located on the site. policies and language, and improving access to hiking trails, ALNC began a remodel in 2018 that will create accessible indoor and outdoor learning labs, providing much-needed classroom space for a variety of programs, including a nature preschool. What truly makes ALNC special, however, is not the building itself, the number of programs offered, or even the beautiful land—it’s the environmental educators who build connections with students and the natural world. It’s the dedicated members and gracious donors who know the importance of places like ALNC and support its environmental education programs and mission. It’s the Leopold legacy and the importance of connecting with and caring for the earth. It’s the pure joy and wonder on a child’s face when she sees the sandhill cranes with their colts or watches a bee collect pollen from a purple coneflower. It’s the desire to learn, to experience, and to preserve this place year after year. Over ALNC’s past 25 years, countless connections have been sparked between children and the natural world— instilling life-long wonder and respect for nature—and all of these connections began with the natural magic that occurs in the prairie, pond, and forests of ALNC. Thanks to our founders, supporters, members, volunteers, staff, and community, ALNC will continue to foster these experiences through discovery, exploration, and learning for the next 25 years and beyond. Cara Erickson is the marketing & communications manager at the Aldo Leopold Nature Center. Photographs provided by the Aldo Leopold Nature Center. featuring flowers and an herb garden. The chef uses those herbs in food preparation and for garnishes. Trestles extend up the far wall, and are used to grow hops. This idea came from Meg Mitchell, a Madison installation artist and professor at the University of Wisconsinâ&#x20AC;&#x201C;Madison art department, and the work is a collaboration with the Civic Exchange Society (CES), Art & Sons design group, and Waunakeebased Octopi Brewing. The goal of CES is to find ways for people to meet and interact. The first beer was made and sold out in spring 2018. In summer, they made passion-fruit cider. A party was held at the end of November at Fresco to launch the new black tea porter. Fresco helps with the launches since they are the exclusive on-site caterer for MMoCA, and it helps them promote the beer they have on their menu. Fresco is 1 of 20 restaurants in the Food Fight Restaurant Group. MMoCA invited them to open the restaurant after the Overture Center for the Arts renovation was completed. Theyâ&#x20AC;&#x2122;re also the exclusive caterer for special occasions at Overture through their Catering a Fresco entity. Food Fight restaurants are 50 percent employee owned, and most of the executive team and operation managers are invested in multiple restaurants. Renting Fresco restaurant and the MMoCA sculpture garden or lobby can accommodate large groups. Fresco is a spectacular setting for business meetings, cocktail parties, rehearsal dinners, weddings, and family celebrations. Open seven days a week, they serve breakfast, lunch, dinner, and cocktailstyle receptions. The combination of location and exquisite epicureal creations means guests always leave with a good taste in their mouths. Lauri Lee is a culinary herb guru and food writer living in Madison, Wisconsin. Photographs by Eric Tadsen. Rutabaga or Madison Boats to get out on these local waterways. If you want to join a group, look for a fullmoon paddle midsummer organized by Brittingham Boats. If you need to build skills, you can join the Madison City Paddlers or sign up for one of many offerings from Madison School & Community Recreation. Of course, a few hours on the Wisconsin River represent just the jumping-off point for river-paddling adventures. Because of the ease of access, numerous sandbars, and lack of dams along the Lower Wisconsin State Riverway, longer camping trips are a regular part of summer on the river. Wisconsin has over 15,000 lakes and 12,600 rivers and streams, so it would be hard to exhaust all the options with so many bodies of water to choose from as well as different types of experiences. And even if you are a novice like me, you might just get hooked on a new way to explore Wisconsin. have chosen, and you paddle at your own pace to the designated pick-up point. Pack a picnic, sun hat, towel, swimsuit, and even some water blasters. Just leave any glass containers at home. Inevitably, you will want to explore one of the sandbars, take a swim, and perhaps throw a Frisbee around. And always keep a sharp eye out for resident wildlife. Liz Wessel is the owner of Green Concierge Travel, which has information for honeymoons and other ecotravel at greenconciergetravel.com. Photographs provided by Green Concierge Travel. Stoughton Hospital accepts over 160 area insurance plans. Please check your individual plan regarding coverage of services at Stoughton Hospital. Let’s face it, in Wisconsin, we need to savor every warm-weathered moment possible. When Mother Nature shines down upon us with favorable temperatures, we need to escape the stuffy trappings we look to for refuge in the winter and soak up the sun. The months ahead will be cause to hold a variety of special events outdoors, including weddings and graduation parties. Across the area, local businesses offering catering services will help plan menus at assorted outdoor events this spring and summer, and each offers their own specialty or niche. LEMONGRASS MADISON CATERING Saren Ouk, owner of Lemongrass Madison Catering, established the business in early 2018, but his experience with food preparation extends back much further. Saren specializes in cooking Cambodian fusion cuisine—a nod to his cultural upbringing and his mother’s influence in food preparation. Since launching Lemongrass, Saren has provided outdoor catering for such organizations as the Madison Blaze women’s tackle football team. Saren also has shared his love of cooking at disparate events across the area. Among them: the Cinco de Mayo festival in Verona, Taste of Madison, and the Monona Community Festival. As 2019’s outdoor events ramp up, Saren says he has more planned on the horizon, including catering his first wedding. lemongrass avocado puree and sweetpickled red onions. “The world is bigger than we know.” MAD CITY CHEFS Ethan Kaercher, executive chef and owner of Mad City Chefs, launched the business in 2012. In the more than halfdecade since its launch, the business has become known for offering what Ethan describes as an affordable luxury—a private chef. The goal, Ethan says, is to offer health-filled, high-quality, chefprepared meals. #1 PLACE TO CELEBRATE BIRTHDAYS . Drink FREE Beer, Soda or Specialty Cocktails on your Birthday! . Over 700,000 birthdays celebrated since 1968! “We are the go-to place for people looking to have fun, casual, folksy weddings,” Jamie says, adding that the cooperative’s expertise with vegan, vegetarian, gluten-free, and other types of specialty cuisine are a notable area of focus. “We appeal to lots of different folks, and we think we have something unique to offer.” Willy Street Co-op also has offered up its outdoor catering services at small home parties and has been putting on display its food preparation services by way of the $5 dinner events that have been offered at the northside location. In terms of outdoor catering, Willy Street Co-op’s niche has been an extension of its in-store offerings. Staffers have provided services and expertise to a range of different events, including weddings. Dave Fidlin is a freelance writer who has a special affinity for Madison. Dave’s career spans nearly 20 years, and he’s grateful for the opportunity to learn something new each day through his professional pursuits. Approachable chef’s specialties served in a historic building with spacious outdoor dining. Hashbrown-encrusted, pan-fried walleye with green beans, onions, and bacon. Not just for Friday night anymore! attractive neighborhood parks. The park served as a focal point for neighborhood social life. Regular band concerts were held in the 1880s and early 1890s. At the turn of the 20th century, the Ladies Aid of Pilgrim Church (now the WilMar Center) often held ice cream socials on the lawn. A small farmers’ market operated in the 1970s. event. Thirty years ago, the MNA took over the production of the Orton Park Festival and today raises $70,000 from the festival. “All the proceeds go back into the community,” says MNA President Lynn Lee. “We support food pantries, the Eastside Express day camp, and scholarships for neighborhood students. “There are many music festivals in the area, but the defining factor about the Orton Park Festival is its flavor. It’s all about neighborhood, community, and family,” says Lynn. “In addition to the Orton Park Festival, MNA also sponsors the Waterfront Festival, scheduled for June 8 to 9, at Yahara Place Park. It’s another family-friendly event with a distinct local focus.” Now that spring is here, the time is right to get out into the open air and experience Madison’s earliest neighborhood park. Jeanne Engle is a freelance writer. out with medicines and tests and stuff that otherwise you’d be responsible for. And secondly, they come to us. That is just wonderful.” Ashley fondly brings up the walks she used to take with Nitro and looks forward to seeing more improvement so that, hopefully by the time you’re reading this, the two of them are back at it, taking in the warm summer air together. some tough questions no pet owner wants to consider. When I met Nitro, he was actually doing a good job getting around, though he definitely wasn’t at 100 percent. But that wasn’t the case a few months ago. “I was more than convinced that I was going to lose him,” says Ashley Grapes, one of Nitro’s owners along with her husband, Gene Grapes. “I am very grateful to these people for everything that they’ve done.” Pets for Life paid for medications and tests and provided x-rays. Dr. Holck tells me they believe Nitro has an intervertebral disease or slipped disc in his back, but it’s hard to see evidence of those conditions on an x-ray. holistic health of communities. The goal is to study how community outreach and pet ownership support programs can benefit not only animals, but also humans, the environment, and society as a whole. a newer initiative, and people don’t know the name. Abbi, who makes up the entire staff of the Pets for Life program, has been going door to door. “I’ve noticed that when I first meet someone, maybe all they want to give me is their first name. That’s fine, I’m a weirdo at your door asking if you need help with your pet.” But this necessary first step builds person-toperson relationships, which are what DCHS believes to be fundamental to the program’s success. Through these relationships, Pets for Life can shape a reality that embodies the core of DCHS. “No matter what their resources are, everyone deserves the love of a pet,” Marissa says. For more of Abbi’s success stories, visit madisonessentials.com. Kyle Jacobson is a copy editor for Madison Essentials, and a writer and beer enthusiast (sometimes all at once) living in Sun Prairie, Wisconsin. profile of green tourism around the world, bringing together suppliers, travel agents, nonprofits, and governments. And they consult professionals in the field regarding these practices.” Green tourism isn’t a trend, it’s vital to our future way of life. Liz notices this in the green tourism business, and says, “We [the United States] have to change our economy to be more sustainable to help with global warming and climate change.” Online research and reviewing websites to find green programs is important, but so is supporting independently owned businesses. Supporting local business makes a trip sustainable not only for the environment, but in the local economy and community. A weekend in Green Lake is the perfect way for us to disconnect from life’s chaos and reconnect with each other. The natural beauty of the lake is breathtaking and calming, and there’s lots to do off the water— biking, golfing, hiking, shopping and dining. There is something special about this place that everyone should experience! iconic place for all sorts of reasons. The last visit, I made a donation to the local friends’ group that cares for the pond. I like to get people involved in what I call travel philanthropy—finding ways to support local communities through your travels. Travel with a purpose. Some see travel as leisure time, but others may want to find adventure or explore new locales with exciting, unique experiences. Liz advises clients to “put your best face on and really go with an open mind. Curiosity is key in getting yourself out there to travel to different places. sustainable. Additional brands offered include Arc’teryx, Darn Tough, EMO, FITS, Icebreaker, INDYGENA, Joy Susan, Lolë, Nau, Patagonia, Smartwool, Stateside, and We Norwegians among others. The broad array of brands and merchandise assortment could, perhaps, be credited to Pam and Troy’s professional resumes. Prior to taking the dive into retailing, the couple worked as sales consultants for a range of national outdoor clothing brands. When they opened Hive, they did so with the relationships and expertise of the marketplace already in tact. At its core, Hive is an outdoor clothing retailer—described by Pam and Troy as a “local outdoor lifestyle boutique.” While the concept of the outdoors is prominent, the store’s product offerings are not limited to diehard campers, hikers, and the like. The goal for Pam is to have something appealing to everyone walking through the doors. of each month and holds the gatherings from 4:00 p.m. to 8:00 p.m. While retailing is a key component of Hive, the mission Pam and Troy have laid out for the business is broader and touches on all of the important elements of community. The goal is for each person walking through the shop’s doors to feel a sense of welcome and belonging. “We want to serve as a resource to the community,” Pam says. Each installment of First Fridays has a special theme. One, for example, was a women’s night, while another was tailored around a guy’s shopping night. Another event was wrapped all around the warmth of wool socks. Regardless of the theme, First Fridays also offer up a number of fun festivities, including servings of cocktails; wine; snacks; and other fun goodies, such as drawings. Dave Fidlin is a freelance writer who has a special affinity for Madison. Dave’s career spans nearly 20 years, and he’s grateful for the opportunity to learn something new each day through his professional pursuits. Photographs by Eric Tadsen. LGBTQ MAGAZINE since 2007 Connecting you to the people, businesses, and events in our community. Join for as little as $4. would’ve taken a major downturn if it wasn’t for his partner, Michael. “The reason I’m able to still have a job, hold a job, function in life, is because he’s doing a lot of stuff for me that I can’t do for myself. If it hadn’t been for that, I’d probably be on disability at this point.” As Colin has always championed for Madison, it seems he found in Michael someone who would support him. And that support goes both ways. Michael is an artist. For some, that should say everything. To fill in the gaps for those who haven’t had the pleasure of knowing a person with the creative side of their brain going 24/7, Colin puts it gently. “Organization and timeliness can be challenges for artists, including my partner.” Colin organizes art shows at a space in the greenhouse of Klein’s and holds another event in Waukesha. A lot of work goes into helping an artist make a living at art, and Colin’s business mindset works well with Michael’s artistic one. Photographs by MOD Media Productions. Life is better on the water. The Midwest’s largest selection of kayaks, canoes, stand-up paddleboards, outdoor gear, and much, much more. marked an end to centuries of statesanctioned segregation in education, today’s schools have become alarmingly more racially and socioeconomically separate than they were in years past. According to a report in the Los Angeles Times, 75 percent of African-American students nationwide attend a school with a student body that is predominantly populated by people of color. The same can be said for public schools in Wisconsin, where the Milwaukee Public School (MPS) District is nearly 90 percent nonwhite. These generally low-income, racially segregated schools typically have more inexperienced teachers, fewer resources, smaller budgets, ill-equipped classrooms, lower graduation rates, and poorer working and learning conditions. The ACLU is committed to the project of expanding educational opportunities for underserved communities and works to ensure that Wisconsin’s youth can pursue the right to an education that is accorded to them under the state constitution. Part of that effort is the ACLU’s 18-year-old youth program which has interacted with thousands of students over the years. David Gwidt is a communications intern with ACLU. Photographs provided by ACLU of Wisconsin. playing roughly or very energetically and takes a bad step, injuring the knee. Older dogs—often those that are overweight—can have weakened ligaments that slowly stretch over time. These weak ligaments can partially tear and, eventually, break down completely. In these dogs, there isn’t usually anything that precedes the complete rupture. It might occur just walking down some stairs or jumping off the couch. Degenerative disease can occur in both large- and small-breed dogs. There are two tough fibrous bands of tissue that cross inside the knee joint: the cranial and the caudal cruciate (cross-shaped) ligaments. They span from one side of the femur (the bone above the knee joint) to the tibia (the bone on the bottom of the knee joint). The cranial cruciate ligament attaches to the front of the tibia and the caudal attaches to the back of the tibia. These ligaments stabilize the knee (stifle) and prevent the tibia from slipping forward out from under the femur. If the cranial cruciate ligament (CrCL or CCL) tears or ruptures, the knee joint is suddenly unstable and very painful. If your dog is suddenly holding up a leg, you should take him to your veterinarian. All the joints in the leg will be moved and felt for swelling, inflammation, and pain. Sometimes a limp is due to an injury on the pad or a broken toenail. Some dogs just over did it playing and running and are sore. Many times, your dog may be started on an anti-inflammatory medication and a week of rest to see if the limp goes away. at the front of the tibia. This basically acts as the cranial cruciate ligament, providing stabilization to the knee. This is a good choice for older, fairly inactive dogs. Over time, however, the suture will break down, and if the dog is too active, the scar tissue around the knee will also break down, leading to lameness again. Proudly made in Prairie du Sac, Wisconsin. authenticity that comes with it that you really cannot fake.” Dave Fidlin is a freelance writer who has a special affinity for Madison. Dave’s career spans nearly 20 years, and he’s grateful for the opportunity to learn something new each day through his professional pursuits. Photographs provided by WORT-FM. As you scroll through social media feeds, how often do you stop to watch a video? I’m not talking about cute puppy videos or the shaky video from your last family reunion, but a well-produced video from one of your favorite brands. And how many times do you like or share those videos? Or, more importantly, how many times have you purchased something because of them? In our mobile, always-connected world, video is the dominant medium for communications and entertainment. It’s everywhere, and we rely on it every day to talk with colleagues and family around the world, to figure out how to change a tire, and to relax after a day at work. In Sandvine’s recent Global Internet Phenomena Report, YouTube alone accounts for 35 percent of all mobile phone traffic in the world. That’s more than Facebook, Snapchat, Instagram, and regular web traffic. It’s no wonder major companies and brands are devoting large resources to creating video content for their customers. authentic message, and establishing expectations that match your customers’ or members’ experiences. •	Answer the Question Why. If you aren’t familiar with The Golden Circle model popularized by Simon Sinek, I encourage you to watch his 2009 TED Talk. On a basic level, his concept is that the most innovative companies communicate and create through the lenses of why they exist. Companies that clearly communicate the driving force behind their brand will more effectively create lasting and meaningful connections. •	Better Message Delivery. Presenting information in a way that stimulates both the auditory and visual senses increases understanding and application of the material by an average of 75 percent. In addition, according to Forrester Research, visuals are processed in the brain 60 times faster than text. They also estimate that consuming one minute of video is equivalent to reading 1.8 million words of content. a new product or service? Do you want to tell the world why your company or organization exists and what its core beliefs are? Maybe you want to capture an event or special moment? There are countless ways to take a simple idea and turn it into a compelling video. •	The Right Partner. Once you have an idea, finding the right partner to bring it to life is key. In Dane County alone, there are a dozen high-quality, experienced video production companies to take your idea from concept to completion. Take the time to research the companies to find which has the background, video look, and culture you like. Once you have your production partner, they’ll help with the rest to make sure the process goes smoothly. While this is a simplified breakdown of the process, it doesn’t get much more complicated. The biggest challenge isn’t the process itself, but rather making the decision to actually begin. Video isn’t a passing fad and will only become more important to our daily lives. With the benefits greatly outweighing any possible negatives, and the return on investment all but guaranteed, you have to ask yourself, what are you waiting for? Eric Redding is the owner/producer at Red Arrow Production. Photographs provided by Red Arrow Production. •	Production. Now that you have your idea and partner, you’re ready to start. Your production partner will work with you to figure out how to best turn your idea into video. They’ll help arrange video shoots, voiceovers, and b-roll footage shoots needed to capture the video content. •	Post-Production. Once the footage has been captured, the pictures collected, and the voiceovers recorded, your production partner will take the content and distill it into a video draft for review. You’ll then go through several draft rounds, giving feedback to the production team to tweak the video. •	Broadcast. Once your video is complete, your production partner will provide you with digital copies to upload to your website so you can share it across all your social media platforms. Then you can watch the likes and shares come in! don’t regularly breathe deeply. They take shallow breaths and just get by. They hold their breath, not realizing how tight they’re holding their stomachs and butts. Why does this matter and how can deep breathing help you leave the closet of should? Breathing deeply and slowly helps soothe the fight or flight responses that your autonomic nervous system frequently sets off in your body even when you aren’t in imminent danger. When this system is triggered, your body releases the hormone cortisol. When cortisol builds up, it can weaken your immune system, negatively affect your mood, and cause insomnia as well as a number of other undesirable effects. I discovered that while deep breathing helped steady me so I could sing in front of thousands of people, my fight or flight response was firing over and over again in my daily life, each time adding to the cortisol load in my body. As a result, I suffered a variety of unexplained health problems, mood swings, and depression. Deep breathing is also important because it helps you to be in the moment. Most people—I was one of them—miss out on a lot of what is happening in their lives because they’re too busy thinking through the past or projecting into the future. While they’re dwelling on something that’s over or worrying about what might go wrong in the future, they completely miss what’s going on in the present. In his book The Power of Now, Eckhart Tolle explains how the breath and being connected to your body helps to break free of this miserable cycle. In my previous life, I was a floating head of misery, trapped between past pain and the worry over how I could soon screw something up. Consistently triggered into fight or flight, my body was locked in tension and my mind locked in panic. I don’t think I even realized I had feet attached to my legs, unless I was going on stage. You have to be present to perform well, and I discovered that the only time I was truly present and alive was on stage. It needed to change. I started to breathe deeply off stage and noticed that my real life calmed down tremendously. I began to notice how often I was triggered into fight or flight, how much I was holding my breath, and how tight my muscles were. I kept a journal to document the things that sparked my anxiety. Whenever I felt anxious, I stopped what I was doing, closed my eyes, focused on my breathing, and thought purposefully about relaxing my muscles. I started by just feeling my body, my hands, and my feet. Eventually, I could calm my body and mind. It soothed my anxiety. Then, free from anxiety, I could be present in my life and appreciate its beauty. needed. By slowing my breath, I slow my heart rate and, thus, calm the other responses in my body that produce the fight or flight reaction. When things are really difficult, I have to stop myself several times a day. How did you do? Did you notice you breathed more just reading this? Try to do it mindfully throughout the day. Catch yourself when you feel annoyed or anxious—stop and breathe. Feel better? Yep, I thought so. Now go on out there and be where your feet are! I dare you. Sandy Eichel is a happy ex-should-er. be viewed by others, that could be sold, paralyzed M.Rose for a long time. “So with this most recent art show— it was via the Queer Pressure, Black Locust shows they do—that was the motivation for me to return to the art practice. In the actual creation of the art, I tried to have it be not about the product and have it be more about the process. I returned to my collage work. I had been doing print and different things at UW, and I returned to collage because that’s been the medium that generated the work I always liked the most. The images always felt most lovely to me. It’s a process that speaks to me.” Today, collage is M.Rose’s dominant medium. through a relationship with nature. woodwork. Glow-in-the-dark glitter glue, mahogany picture frames, and iridescent wrapping paper all comprise the playful collection of M.Rose’s most recent, perhaps most authentic work. One of the instrumental pieces of the show was Deep Melt, a framed image of two lovers kissing, surrounded by green illustrated tendrils, pink iridescent textured paper, and a black-and-white landscape photograph of a frozen lake and trees. The figures are tender, sitting on the ground with their legs tucked, one slightly leaning into the other. The viewer is immediately melted by their softness, accentuated by the beauty that cradles them. provided them an environment where nuance and vulnerability could nourish. Out of the forest, M.Rose has blossomed, offering us whimsy and inviting us to celebrate. M.Rose’s work can be found on Facebook: M.Rose Sweetnam Art. Additionally, they do commissions. Email mrosesweetnam@gmail.com to learn more. Elissa Koppel is a freelance writer and a local artist. Photographs provided by M.Rose Sweetnam. Untappd and apps like it have created landscapes for all beer drinkers, from the binge-drinking teenager to the Cicerone-certified cervezaphile, to lay down their knowledge, or lack of, as equals. This isn’t to say there isn’t good in these apps, but how they’re used can sometimes leave other beer drinkers and brewers scratching their heads. I sent a questionnaire to individuals who might help me shine some light on the pluses and minuses of such platforms, and Cicero, Sterling, Willamette, and Dr. Rudi were kind enough to respond. For those unfamiliar, Untappd, what Cicero calls the “Yelp of beers,” encourages its users to keep track of beers they’ve tried by rating them. When they do this, users are awarded badges. they can refer to when trying new beers or rediscovering old favorites. The potential in an app like Untappd to help engage beer enthusiasts with one another across the state, nation, and globe is there. I think app users would do well to remember that these platforms aren’t there in hopes of being abused and that reviewing a plethora of beer does not an expert make. Even experts could use a reminder from time to time that brewing is an art. There is the science of the craft, but it’s so much an expression of the individual behind the beer that to ignore where it’s coming from and what’s going on in that person’s mind does a disservice to the product. There are a lot of people on Untappd saying what the brewer should do to make the beer taste like they want it to taste. Sterling says, “If everyone says a beer is too this or too that, it won’t make me change a recipe on something that matched my original vision.” It’s not uncommon to hear of a brewery working on a new beer and dumping the entire batch because it didn’t come out the way the brewer wanted. I remember years ago mixing beers and having fun seeing what profiles worked well with one another. I asked the brewer to try some and he refused, saying, “If I wanted to taste a beer like that, I’d make that beer.” The takeaway I hope for from this article is continued acknowledgement that we have the ability to put our opinions out there without any filter whatsoever. Whether or not a person respects Tom Waits, Picasso, or their local brewer, I wish them to remember that what artists do, they do with intention. Drinking a beer is access to something intimate that deserves more consideration than fulfilling quests for digital awards. To the mindful, the appreciative, and the accomplished. May their relationships further our own. Kyle Jacobson is a copy editor for Madison Essentials, and a writer and beer enthusiast (sometimes all at once) living in Sun Prairie, Wisconsin. Photographs by Kyle Jacobson. alongside the garage, or in the back of the yard. Thyme is a must have for French cooking. Marginally hardy and slow growing, French thyme is a diminutive plant with fine textured evergreen leaves. Plant in groups at the edge of the garden and use it for trim in container gardens. If you like to cook, it may truly be hard to have enough thyme. Greek oregano, much like thyme, is marginally hardy and excellent in containers. Rosemary is the one of the few herbs to happily overwinter in the house. Keep it evenly moist in a sunny window, and it will grow sizable enough to harvest. Fresh rosemary is a favorite seasoning for roast chicken, pork, and lamb. Try making a healthful tea or invigorating hair rinse by boiling a sprig of rosemary in water for 5 to 10 minutes. It’s worth it for the aroma therapy. OUTDOOR CREATIV VE cooking. Thin seedling when they are five to six inches by pulling out the majority of baby plants. Leave only one or two dill babies per square foot. Use to season fish, green beans, salads, and more. To grow dill for pickling, sow seeds again at the same time you plant your cucumber. Joan W. Ziegler is a horticulturist and garden designer and winner of the 2015 Perennial Plant Association Merit Award for Residential Landscape at ZDA, Inc. Landscape Architecture, 4797 Capitol View Road, Middleton. Call (608) 831-5098 or visit zdainc.com. Photographs provided by ZDA, Inc.
It’s hard to think of summer without fresh basil. A renowned companion for tomatoes, it too hates the cold. Wait until the end of May or the first of June to plant outside, and then plant more in July so that there are fresh plants through the end of summer. Fresh and flavorful, herbs are easy to grow and wonderful to have on hand. They mark the seasons, define cuisines, and add beauty to the garden. Try growing a planter of herbs outside the kitchen door; mix them into flower beds and plant amongst vegetables to help them grow healthy and strong. My mom always said, “It’s not that I’m a great cook, it’s just that I use fresh ingredients.” You may be surprised how a sprig of this or a tablespoon of that can elevate the simple to the sublime. and basil by growing them mixed in amongst flowers and vegetables or grouping them in container gardens. Cilantro and coriander are one and the same. Both are used extensively in Latin, Asian, and Indian cuisine. Cilantro, the leafy parsley-like part of the plant, bolts quickly to produce coriander seeds. For a continuous supply, cilantro has to be planted repeatedly throughout the summer. For recipes incorporating garden herbs, visit madisonessentials.com. Gift Card! Question: “What local retail business holds First Friday gatherings the first Friday of each month?” Enter by submitting your answer to the above question online at madisonessentials.com, or by mail with your name, mailing address, phone number, and email to: Madison Essentials c/o Towns & Associates, Inc. PO Box 174 Baraboo, WI 53913-0174 All entries with the correct answer will be entered into a drawing for one of two $50 gift cards. Contest deadline is May 20, 2019. Gift cards will be honored at all Food Fight® Restaurant Group restaurants (see foodfightinc.com). Winners Thank you to everyone who entered our previous contest. The answer to the question, “What local business resulted from a group of volunteers coming together at the University of Wisconsin–Student Association” is Community Pharmacy. A $50 Food Fight Gift Card was sent to each of our winners, Maria Kubota of Beaver Dam and Tammy Turnquist of Madison. Hey now, you’re a rock star! Join us at 7:30 pm for a Shrek Costume Group Photo on Friday before Smash Mouth takes the stage to play all your Shrek favorites. Meet us in front of the VIP tent! 3 DAYS – 3 STAGES – 75+ BANDS HEY! FRIDAY, MAY 24TH IS... TAKE YOUR BRAT TO WORK DAY!